MAINSTAGE PRODUCTION - Thanks for a great show. Our audiences were terrific and the audience response to this production was just terrific for our production of INTO THE WOODS. INTO THE WOODS was performed at the Performing Arts Center at Taconic Central School in Craryville, NY. We had a great run of 6 wonderful performances, each one with a full & very enthusiastic audience. INTO THE WOODS - a well received full orchestra production! This award winning musical intertwines the plots of several Brothers Grimm fairy tales & and follows them to explore the consequences of the characters' wishes and quests. The musical is tied together by an original story involving a childless baker and his wife and their quest to begin a family, their interaction with a Witch who has placed a curse on them, and their interaction with other storybook characters during their journey. Performances were on Oct. 10,11,12 & the following weekend of Oct. 17,18 & 19, 2014. I'd like information about your next production. We brought another couple to see our first Two of Us show. What a wonderful production. From the actors to the crew, staging, costumes, orchestra and venue we could not have seen a better show!!! Wow! -- Georgia V.Z. I saw the show last night ... congratulations for a beautiful production. I have to hand it to you .. a class act all the way!! My first time at Taconic Hills - WOW! Perfect venue for you guys. You made beautiful use of the space. -- Edgar A. Chatham NY. Great production with beautiful costumes and wonderful staging. It must have been fun to work with such a talented bunch. -- Lael L., Chatham NY. 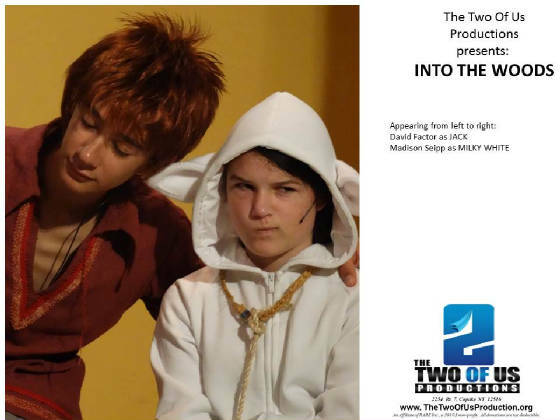 Be a supporter of The Two of Us Productions! If you'd like to support our mission but can't be there in person we'd like to add you to our growing list of theater angels and business sponsors. Please visit our Supporters page to make an on-line donation . Stephen Sondheim’s beloved musical fairy tale, Into The Woods is coming to the Columbia County stage! 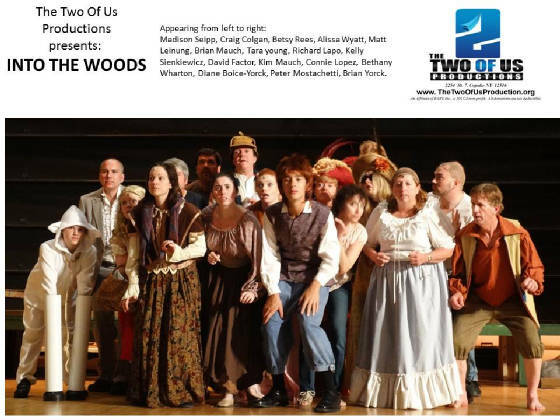 The Two Of Us Productions Inc., based in Columbia County NY, is proud to present a fully staged original production of Into The Woods, the multi-award winning Broadway musical. 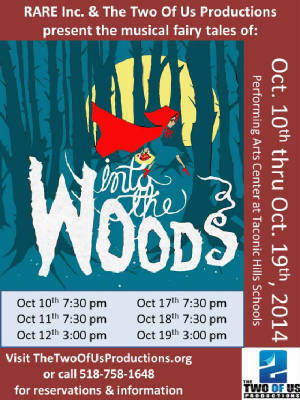 Into The Woods is being presented from October 10th to 19th 2014 at the well-equipped Performing Arts Center at Taconic Hills Schools. The Performing Arts Center is located in Craryville, NY on Rt. 23, just a short drive from Hudson NY, Hillsdale NY, or Great Barrington MA. The Two Of Us Productions is very pleased to bring the charming musical fairy tale to our Hudson Valley audience. The characters are engaging and interesting, presenting interesting problems and situations for our adult theater fans, but at the same time presenting a charming fairy tale of familiar characters for our younger audience members. All in all, this will be a delightful evening for everyone. With a new Disney movie of Into TheWoods coming out later this year, there is tremendous interest in this show and we are very pleased to bring this show to the local stage. The Two Of Us Productions has called together a tightly knit ensemble of experienced area actors and musicians to bring this wonderful musical drama to the local stage. “Our rehearsal process has been an exciting one,” says Stephen Sanborn, director/conductor and co-producer for The Two Of Us Productions. “To see this whimsical and at times bittersweet story, and Sondheims well known music come to life is truly a privilege. Having the honor to conduct this score with these fine musicians is a wonderful experience.” Constance Lopez, co-producer and cast as the jinxed Witch states that, “to be able to perform with such a talented cast and orchestra is a rare opportunity … it is very fulfilling to work with such a cohesive cast who truly see every role as important ”. Stephen & Constance, working with their talented vocal director Daniel Galliher, are in the midst of rehearsing their 20 person cast and 14 piece orchestra, and looking forward to their opening on October 10th. Be a part of the action! If you are interested in getting involved in front of the foot lights or behind the scenes with our production team? We'd love to hear from you. From house management, to concessions, to musicians and artists, actors and stage crew, there's a place for everyone.